I planted this little bitty garden last summer and put it on my deck railing. I made a little rock path and added a little ceramic house I had gotten a few years back. I managed to give it a drink now and then. And it began to grow. And each time I found a golf ball, I'd find a little spot to add it to the garden. The collection is growing and so are the plants. And then winter. I looked at it the other day and took this photograph. It looks like it's a ruin... a little house reclaimed by the earth and gravity. It's been a tough winter, this is perfectly fitting. I could pick up the pieces, clean it out and start over in the Spring... but I like it this way. It's very beautiful in it's own ruined and broken way, like an old Scottish castle ruin. Plus... it is authentic. Spring is coming, it won't be long now... until then the garden is exactly as it should be. And even if I can't put the pieces back together, it is ok, it was only a house. What a delightful little garden . . . and story. Please show us what you do with it when spring does finally show up, won't you? Answering the question... What media do I work in? How to make a five point star quilt tutorial slideshow. Another necklace I designed that has been internationally published. 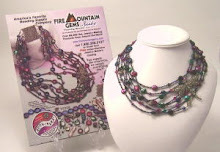 my floral pearl necklace has been used in adverts for Fire Mt Gems on the back of trade magazines and in catalogs. 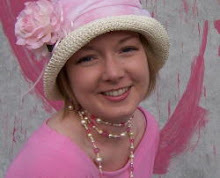 This Dragonfly Necklace was also used in Fire Mt ads and catalogs. Oops! Watch out for that... Snow!